The Federal Register is a government publication that is issued daily and is the official source of announcements. These include federal government agencies' and organizations' new rules and proposed rules, announcements from the president, and notices – including grant announcements. The amount of information available can appear overwhelming, but you can easily learn how to use it to stay up to date and ahead of your competition. Important Note: The Federal Register website has changed dramatically. We are in the process of learning the new site so we can give you a clear, simplified guide to how it works. Please check back to see where we stand, and we will let people know that the work in complete in our Newsletter. As a result of the unexpected update, our illustrated guide below will not match the website. We apologize and expect to have a new guide soon. In the meantime you can go to federal register.gov and enter your search term in the search box at the top. Tired of fake news? We don’t blame you! It’s almost always advisable to do your own research — on trusted sites — when you hear something you’re not sure you should believe — and that includes plenty of what you hear in the media. Information about new government rules and regulations can be easily checked in the Federal Register. This is a central repository of all government agency’s regulations — as opposed to previous days when each agency would publish its own notices, bulletins etc. When even the Department of Justice couldn’t figure out what the current rules were a centralized approach was developed. re you a curious techie or perhaps have a friend who is? The Federal Register has an API that lets you have access to all the site’s contents since 1994. Installing the Federal Register package is relatively simple. It would make it easy for you to see, for example, all the Executive Orders that have been issued since that time — so that would be under Obama, Bush, and Clinton. You can also retrieve the executive orders to see precisely what they say. So if you’re not sure you’re always getting a complete and unbiased story from your news sources you can always go directly to the official source for much government-related information. The Federal Register is huge — and got a lot larger under the Obama administration. In fact, at the end of the Obama administration’s tenure theRegister hit more than 97,000 pages — almost a 23% increase in just eight years — and it costs the U.S. taxpayers almost $19 trillion every year. That’s about $15,000 per U.S. household, yikes! It is a major goal of the current administration to roll back many of the most burdensome rules which hurt the economy, empower the bureaucracy and limit limit people’s freedoms. So there may be a bit less to read if you want to comb through the Federal Register but that sounds like it’s probably a good thing. If you are looking for the Federal Register you might run into the non-government website federalregister.com. This site is private owned by a software compliance company. It claims that it is the same as the Federal Register in terms of the information provided. What allegedly differentiates it is a number of “productivity-enhancing tools.” We are not sure what those are, but they do make it easy to look for specific publications using their search function or by browsing all publications (yikes) by agency and/or year. Ever feel like things happen and you wonder why you never heard about it beforehand, or didn’t get a chance to express your opinion about it? That’s probably because the media didn’t consider it worthwhile or you weren’t proactive about going and seeking out information. Nothing wrong with that — most of us depend on news sources to alert us to important events. But maybe you have a different idea about what’s important and want to know more. That’s where the Federal Register comes in. Proposed rules are published daily and the description includes whether it is open to public comment. If so, you may comment. But you may not even know about it until it’s a done deal if you don’t check the Federal Register regularly. You can also sign up for an account on the Register and choose some subscription options. For example, you can have each day’s table of contents sent to you in a daily email. Or choose to see documents from a specific agency, or on a specific topic or just get proposed rules. Are you kind of a nerd about following what government agencies do and what sort of laws get initiated and enacted? If so the Federal Register may be your playground. Now that doesn’t mean that you have to go sorting through long lists of government topics to find something interesting. As they continue to enhance this site there are features that draw your attention to what is going on today. For example the “Popular Documents” section on one day may show you that there is a lot going on looking in to Payday Loans and other high-cost loans. That means perhaps trouble is ahead for those who provide such loans. Or you might notice that there are revisions to Medicare payment policies — and that may not be good news to you as a doctor or as a patient. the opening page will also show you topics that have been particularly busy over the past year. Again, interesting stuff … but it’s not likely to get you a grant. The Federal Register contains a ton of information, much of which will be of little or no interest to you. You may be interested in announcements like the one noted below about changes in the minimum wage – but you are likely to hear that on the news anyway. Unless you love reading lengthy articles with a lot of government speak this is probably not the site for you. Read instead our instructions for doing grants searches that are relevant to you in our article about grants.gov. There is one easy-to-find section though that you may be interested in — it's called MONEY and it's midway down the home page on the left. Here you'll see a few headlines about money-related topics. Some won't make any sense to you but some will be grant (or “funding opportunity”) announcements which you might want to know about. As of this writing there is an announcement about new funding available for Native American (including Native Hawaiians, Alaskans and Pacific Islanders) schools and English learners. And you can click on that line item for more information. Make a note to check here regularly and you might learn about an opportunity before your competition! It may interest you to know that you can also find wage-related news on the Fedearl Register site. Recently a bulletin was released regarding the minimum wage. Beginning January 1, 2016, the minimum wage that will be paid to those workers who work on “covered contract” – or on work related to them – will increase to $10.15 an hour. And, even for employees who receive tips, those who work not those same contracts must be pad at least $5.85 an hour. Notice that under the heading “2011(Volume 76)Only,” there are two options: the Quick Search and the Advanced Search. Begin with the Quick Search: enter the search terms relevant to the type of grant you are looking for into the space provided. An extra tip here: include the words “notices” and “grants” in your search so that you don't get a lot of extraneous information about agencies' new rules and such. Also, to see results that include all of your terms, use the all-caps word AND in between your terms. 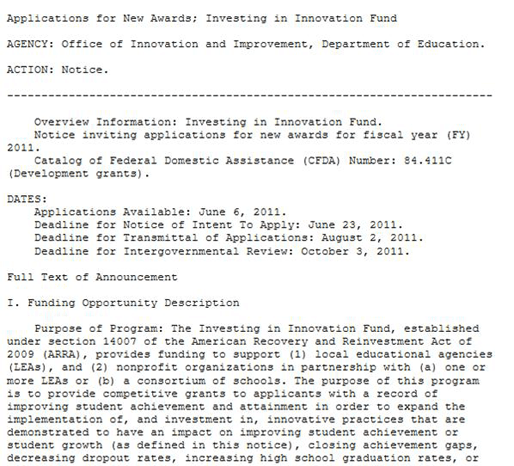 For example, if you wanted to look for new grants related to teaching, you might enter the terms: notices AND grants AND teaching. After you've entered your search terms, click Submit and you will get a list of results in order of relevancy to those terms. You can choose to view individual results in detail in HTML or PDF form, or you can simply look at a summary. We recommend the Summary to begin with so you can see right away if the opportunity is of interest. Any of the files may be saved to your computer. Though we have not included the full text, you can probably tell fairly quickly if the grant would be of interest to you. It is also important to note the critical dates given at the very beginning of the document. The deadline for filing your intent to apply was just under three weeks after applications were first made available. So it is obviously crucial to find these announcements early. To narrow down your search to a specific grant announcement or to announcements made within a specific time period, take a look at our discussion of how to Refine Your Federal Register Search.